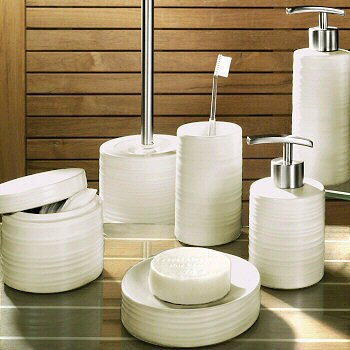 Round porcelain bath accessories with a matte finish and ribbed design available in putty, spring green and nut brown. The pump on the dispensers are brushed chrome as well as the handle for the toilet brush. The size options include a porcelain toothbrush holder, tumbler, soap dish, soap or lotion dispenser in two sizes, container with lid and porcelain toilet brush set. Round design with matte finish and ribbed surface and brushed chrome accents.